Thank you for your ongoing interest in the Mallee Regional Partnership and in our 2018 Regional Assembly which took place in Kerang on 31 May 2018. We were thrilled with the attendance of around 200 people at the Assembly and we want to keep you, our community, up to date with developments, and our work. The 2018 Mallee Regional Assembly was the Partnership’s third major opportunity to consult with the community. In addition to local residents, businesses and organisation representatives, the Assembly was attended by three Victorian Government Ministers: the Minister for Agriculture and Regional Development Jaala Pulford, the Minister for Public Transport and Major Projects Jacinta Allan and the Attorney General Martin Pakula. The Parliamentary Secretary for Regional Victoria Danielle Green also attended. The Assembly began with a Welcome to Country and wonderful Smoking Ceremony provided by the local Indigenous Community led by Esther Kirby who was awarded a Medal of the Order of Australia (OAM) recently. The Mallee Regional Partnership then presented a snapshot of achievements over the past two years, followed by, and most importantly, discussions with our community on our and their top priorities. These priorities included the economy, access to services (health and education), connectivity (digital and transport), liveability and sustaining small towns. Two groups took community democracy into their own hands and created their own discussion themes around protection of the natural environment and eco-tourism. Read more about the Assembly here. 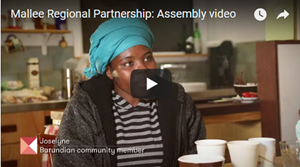 As part of the Assembly, we screened a short video outlining some of the Partnership’s priorities and achievements over the past two years. You can view the video here. As a Partnership, our role is to now take all the messages and ideas we have heard from our 2018 Assembly, and through our wider consultation, and action them. One way we do this is by presenting on what we have heard to the Victorian Government’s Rural and Regional Ministerial Committee. That presentation happened at the end of July. Also, over the coming months, the Partnership will continue to be involved in a range of priority projects which have already received funding, including the Mallee Regional Innovation Centre, Food Next Door and the establishment of a Cross Border Commission. On the latter, we were thrilled when the Government listened to the Mallee community and committed $800,000 in the 2018/19 State Budget to establish a Cross Border Commission. We are very pleased that the recruitment for this really important Commissioner role is now underway. Though our 2018 Assembly is now behind us, the Partnership is very keen to continue the consultation process and the ongoing engagement with the community. We will of course also keep you abreast of announcements and initiatives relevant to our region, via our website, email and on our Partnership Facebook page. Again, thank you for giving your time and insight, whether by attending the Assembly, a meeting, or being active on our Engage page. Your views are incredibly valuable and this process means our region has a direct voice into Government. We look forward to keeping the conversation going.